You see them just about everywhere you go. 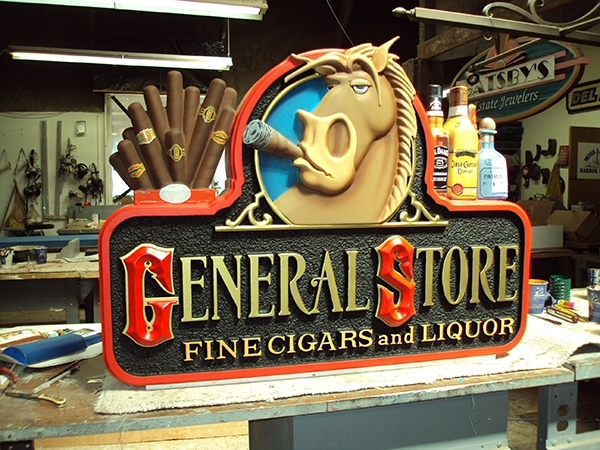 Whether it’s for restaurants, gas stations, general stores, or movie theaters, business signs are all around us. Some are simple, containing some general script and design, while others are much more elaborate. Both have a single job to do: attract people to their business. At Signs by Van in Monterey County, we can make a custom business sign for your company that not only shows off your unique business appeal, but gets people to come into your establishment. Numerous studies have shown that businesses with signs have an advantage in their marketing strategies and usually get more people to come into their store. According to Chris Joseph’s article “The Importance of Signage in a Business,” in Chron Magazine, “…signs can be an essential component of a business’s overall marketing strategy.” Joseph also says that a sign that “contains a business’s logo can help reinforce the brand.” This can set your company apart from the competition and give you an edge. If you’re in a highly competitive market, such as the restaurant business, then a sign is a must-have commodity to letting people know where you are, who you are, and what you do. At Signs by Van, we believe that your business deserves to be professionally and uniquely branded. Our professional sign makers can create a custom business sign for your company, one that looks amazing, lasts a long time, and helps bring customers to your business day-after-day, and year-after-year. Our professional sign designers will work with you to create a custom sign that’s all about you and your company. Let us know what you like, what you don’t like, and exactly what you want to do with your business. Our expert sign makers will help create the perfect sign for your business. Not only will you love it, but everyone that sees it will as well. Not only will you get increased business and foot traffic, but you’ll have everyone talking about your custom-built sign. SBV only partners with the top of the line suppliers, consultants, and workers who know our clientele, allowing us to offer the best expertise to everyone who hires Signs by Van. Our master sign builders will create your custom company sign by hand. We also offer a variety of material options, from wood, to metal, and even electric. We service anyone and everyone, from San Francisco to San Diego; no company is too big or too small for us. Get started on your custom business sign today, and contact Signs by Van in Monterey County to get your free quote.